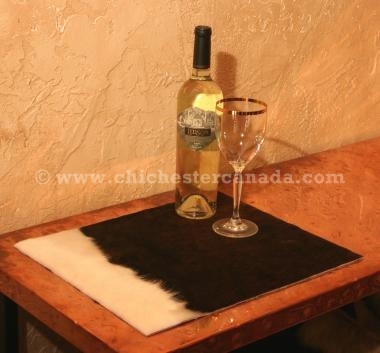 We can supply cow skin placemats in large quantities for restaurants in two styles - oval and rectangular. 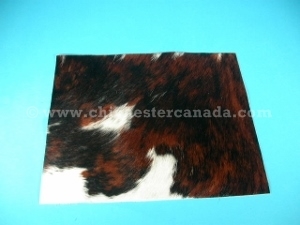 The placemats are made out of different kinds of natural colored cow skins in various colors and patterns. 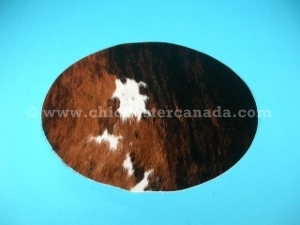 We suggest using shorter-hair cow skins such as brindle, salt and pepper, and exotic/tri-color rather than long-hair cow skins such as Hereford. Every cow skin is different so each placemat will be unique. We can produce custom sizes of the rectangular placemat. The standard placemat does not have any backing or trim. Adding a backing and trim to the placemats will possibly double the cost and add at least a week to production time. A vinyl or rubber backing (in black, brown, or gray) can be glued on to the skin to prevent water from getting in between the backing and the skin. A lacing or an edge finish in the same color as the backing will make it look better. We do not recommend a leather backing because it will be damaged when it gets wet. The placemats should give years of service with gentle use. They will get damaged if someone spills a glass of red wine on them or makes too big of a mess. We recommend buying some extra placemats because some will get damaged beyond use over time. You may also want to keep a few extra on hand to sell to your customers. Do not wash the placemats by submerging them in water. Avoid getting the placemats thoroughly wet as they will shrink and stiffen up. Shake off basic debris, like crumbs, or brush it with a stiff brush along the nap (in the direction of the hair). We also offer a lanolin-based cleaner called Eucalan for a more thorough cleaning, like removing mashed potatoes from the hair. Use a damp cloth or sponge with Eucalan to clean along the nap repeatedly. Rinse the sponge to remove the dirt and Eucalan until it is cleaned. Then dry using a towel running along the nap.